My research investigates ways to remove barriers and improve school/university climates for underrepresented students in Science, Technology, Engineering and Math (commonly abbreviated to "STEM"). My focus is largely on LGBTQIA students, and intersections with the experiences of students of colour, women, and students with disabilities. 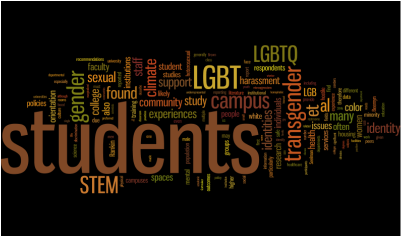 My MA critique, on best practices for supporting LGBTQ students in STEM higher education, is available on my publications page, and a modified excerpt on the myth and reality of meritocracy was recently published on the Women in Astronomy blog. In addition to the experiences of underrepresented students in STEM, I am also conducting research into the factors that predict the general public's support of science and government funding for science research. Papers are in progress. I have mostly wrapped up my astronomy research, although there are some papers that are still to come out as a result of work with collaborators. My research was largely focused on the search for dusty debris disks around white dwarfs, as a test of the ultimate fate of planetary systems like our own. As the main-sequence stars hosting planetary systems evolve through the red giant stage, they swell up in radius and destroy planets and asteroids out to many hundred solar radii. It is therefore impossible that the material making up the present-day disks, located a few AU from the WD, has survived the giant phase at its current location, and must instead have been brought inwards from outside a distance of a few hundred solar radii. Planetary debris that migrates outwards to large radii during the giant phase is expected to have relatively stable orbits unless perturbed by larger-mass objects. A likely scenario is therefore that one or more planets that survive the evolution of the WD progenitor destabilise the orbit of an asteroid at some point after the end of the planetary nebula phase. Getting close enough to the compact star, the asteroid is tidally disrupted, forming a disk of metal-rich debris which subsequently sublimates in the radiation field of the white dwarf. My research focused on a type of star called a "white dwarf" - the dying ember of a star like our Sun. For most of their lives, Sun-like stars happily convert hydrogen into helium in a runaway nuclear reaction in their central cores. This process creates a huge amount of energy, that we see and feel as light and heat. At some point, however, the hydrogen in the core runs out, and there is nothing left for the star to burn. At this point, the star swells up to a few hundred - few thousand times its original size, to become a red giant. In doing so, it swallows up all of the planets that it touches. In our own Solar System, the Sun is likely to swallow up Mercury, Venus, and possibly Earth, but Mars will probably survive. The final death throes of the star see its outer layers puffed off into space as a "planetary nebula", leaving the white-hot core of the star exposed. With no ongoing nuclear reactions, this "white dwarf" simply sits and cools for the rest of eternity. The really interesting question, though, is what happens to any planets left around the white dwarf after surviving the red giant phase. At the distances of Neptune and further, it is impossible for us to detect them directly - they are too cool to be seen with our telescopes. Do they stay in orbit around their stars, as we expect, or are they destroyed, or somehow lost as their parent star evolves? A clue to their fate has been the discovery of dusty rings around some white dwarfs. These rings shouldn't really be there - all of the material that close in to the white dwarf should have been destroyed during the red giant phase. This leads us to believe that it has arrived there *after* the star has become a white dwarf, thrown in from the outer edges of the system. The most likely scenario is that there are a large number of asteroids in the outer reaches of the system, which, under normal circumstances, would happily sit there and orbit around the star at very large distances. This changes, however, if we imagine that there are some big left-over planets out there too. Just as in our Solar System today, big planets disrupt the orbits of smaller asteroids, and can fling them in towards the central star. 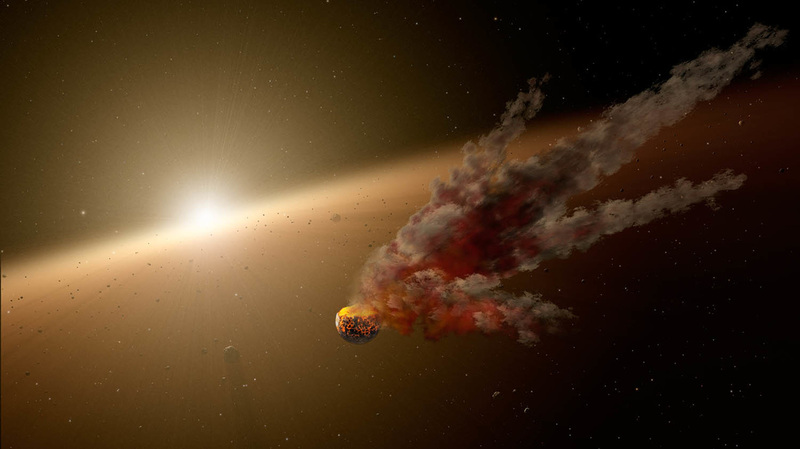 If one of these asteroids gets too close to the white dwarf, large tidal forces can rip it apart and shred it into dust, which then settles into a ring, or "disk", around the star. The really cool part about all of this is that it is very difficult to get an asteroid thrown in towards the white dwarf *unless* it has been affected by a large planet. By detecting these dusty disks around white dwarfs, we believe that we are indirectly detecting the presence of large surviving planets that are too cool and too far from their star to be detected by any other method.